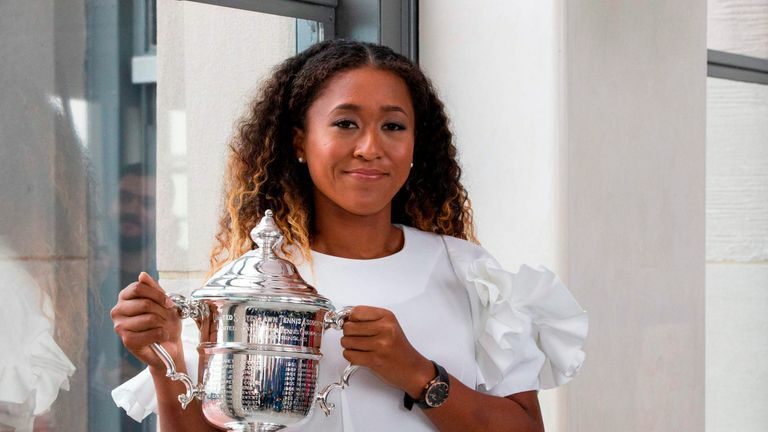 "For me I don't feel sad because I wouldn't even know what I'm expected to feel"
Naomi Osaka has refused to criticise Serena Williams saying she has no hard feelings after her US Open win was overshadowed by the American's furious row with the umpire. The 20-year-old broke down in tears after beating Williams 6-2 6-4 to become Japan's first Grand Slam singles champion in New York last weekend. But Osaka insisted there were no hard feelings towards the 23-time Grand Slam champion, who branded umpire Carlos Ramos a "thief" in an astonishing tantrum triggered by a code violation. "For me I don't feel sad because I wouldn't even know what I'm expected to feel," said Osaka. "I don't think I even thought about feeling sad because there's no experience for me to draw on in any other Grand Slam final. "I just thought I shouldn't have any regrets. Overall I felt really happy and know I accomplished a lot." Osaka, who competes at next week's Pan Pacific Open in Tokyo, also revealed her plans to break into the top five this year, and win a gold medal at the 2020 Tokyo Olympics. "I think for this year my immediate goal would be to get to Singapore," said Osaka after putting herself firmly in contention to reach the season-ending WTA Finals. "I want to do well at the Pan Pacific Open and maybe year-end top five -- but I'm not putting pressure on myself. For now, I'm just sort of riding the wave." "Of course I'm very excited the Olympics are going to be held in Tokyo," added Osaka, who is of Haitian-Japanese descent and was raised in the United States. "It's every athlete's dream to play in the Olympics, so of course it would be my goal to win gold." We have every major tennis event covered from all angles via our website skysports.com/tennis. On the move? Head to our app for mobile devices and iPad, or follow our Twitter account @SkySportsTennis to join in the conversation. We will bring you news, previews, live blogs, reports, reaction and expert analysis. Tennis is back on Sky Sports screens with the Laver Cup in September while we will also have coverage of the ATP Finals in November with every match live on Sky Sports.